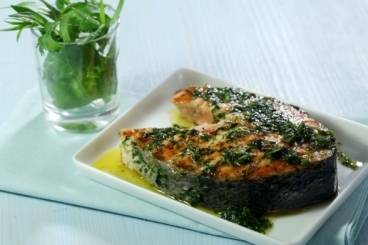 Salmon steaks marinated in coriander, basil and tarragon and cooked on the chargrill. Wash and pick all of the herbs. Place the leaves in a blender with the olive oil, tomato vinegar and the salt. Coat the salmon steaks in the marinade and then chill in the fridge for 1 hour. Heat a griddle pan to very hot and then cook the salmon steaks for 5 minutes on each side. Season with salt and piment d'Espelette to serve.